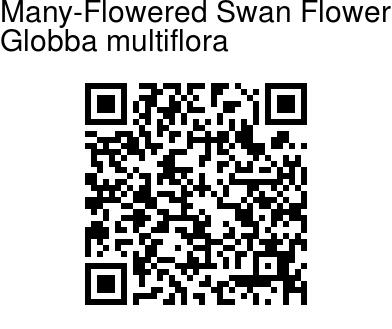 Many-Flowered Swan Flower is a herb with leafy shoots up to 2 ft tall. Leaves are lanceshaped, prominently with a tail, stalkless, 20-30 x 3-6 cm, velvet-hairy beneath; ligule bilobed, 1-2 mm, velvet-hairy. (flowers not clustered); cincinnus stalks 1cm or much less; bracteoles minute, soon deciduous. Yellow flowers are borne in panicle 15-30 cm long, with rachis and branchlets velvet-hairy, bracts small, soon falling off, those at base of inflorescence, producing bulbils, those from upper part subtending cincinni of 4-6 yellow flowers. Flowers are not crowded at the branchlet tips. Calyx is 3-lobed, 3-4mm. 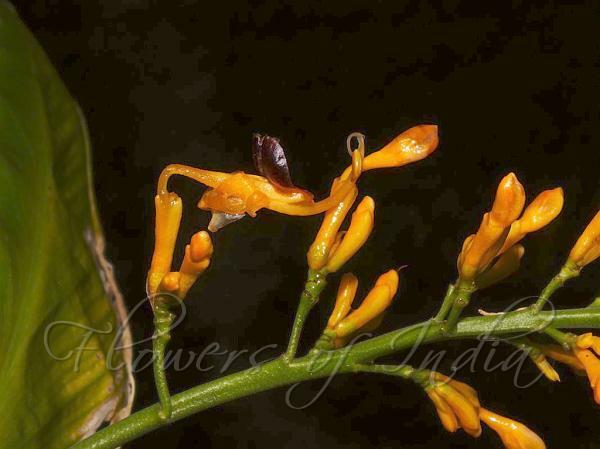 Flower tube is 3 times the length of calyx, petals ovate, 3mm. Lateral staminodes 3-4mm; lip similar, shortly bilobed. Stamen about 1.5 cm. Capsule is hairless. Many-Flowered Swan Flower is found in Eastern Himalayas, in Sikkim, Assam. Identification credit: Nidhan Singh, M. Sabu Photographed in Vishwanath District, Assam.